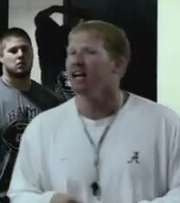 One of the primary reasons for Alabama football's resurgence on the football gridiron in the last couple of years can be directly attributed to one man, strength and conditioning coach Scott Cochran. If you get anywhere around him on campus in Tuscaloosa, you definitely know when he's around. His voice is easily heard hollaring at the Bama players to keep pushing. He is one of the top strength and conditioning coaches in the country, but it isn't just based on what he knows. It goes deeper than that. He is highly motivational in the way that he pushes his players to push their bodies to their physical limits and beyond. He is like a buzz saw that never stops. You will see him at the weight room continually shouting a barage of motivational catchphrases like..
"I don't care what you did yesterday, if you happy with it, you got bigger problems!" "Doubt me... pay the price!" "It don't get any betta than this!" "Why are we standing around?" "If it feels good... you aren't doing it righttttttt!!!" "You ain't cheating me, you are cheating you!" "You have to make today count!!" Coach Cochran offers straight-up high-energy motivational weight lifting sessions for the groups of Alabama players who lift weights throughout the day. When he is there with the players, they are all his. It is that point of focus that helps him work into the foucused frenzy that is so effective. said that Coach Cochran yells every day yet "never loses his voice." As super-human as it seems, Coach Cochran is going to give his all every day, because "that's Coach Saban's standard." Julio Jones, wide receiver, said "Outrageous man.. it just don't know. You can't contain that guy. He's just a loose cannon." Speaking on the impact of Scott Cochran in the weight room to make the Alabama players work harder, Greg McElroy, undefeated starting quarterback, said "He (Coach Cochran) is the life blood of our program. He is definitely our leader for inspiration as far as motivation." It isn't all rah-rah cheerleading, behind all the yelling and motivational one-liners, Coach Cochran has a keen knowledge of how to push the human body to its maximum potential. In fact, he has a degree in kinesiology which is the study of human movement. Kinesiologists usually work with disabled individuals to help rehabilitate to the maximum physical functionality. There's no doubt that his knowledge played a big part in Dont'a Hightower's recovery from last year serious knee injury. The overall result is a team that is heading in the direction of building a dynasty based on physical dominance on the football field. You can attribute that to Coach Cochran's motivational and intellectual buzz saw that as Alabama playing like the buzz saw.